I was excited that just a mouthwash at a very reasonable price would whiten my teeth. I bought it and at first it made my mouth feel cleaner after brushing but after about 3 weeks of use my mouth felt so raw. My teeth look almost transparent? I'm no dentist but it seems this is much more abrasive than necessary. I discontinued use and now my teeth look worse than before. I truly think it stripped the enamel off my teeth and now everything I eat or drink darkens my teeth. 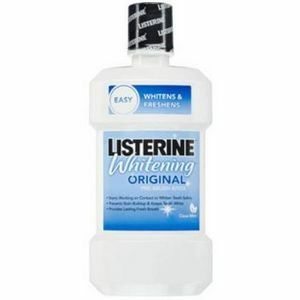 Listerine whitening mouth rinse is an amazing product. The entry of this product in to the market revolutionized the mouth hygiene concept. I have been using this product for more than five years. When I rinse my mouth using listerine whitening, I not only experience freshness in my breathe but also my teeth glitters. Its a must product for those who eat too much of onions and garlic. I carry this product where-ever I travel. From listerin rather use a classic rinser for mouth washing, the whitening solution doesnt feel so powerfull, dont like the taste and doest work as good as crest. I have been a user of Listerine products for a number of years now. I grew up using it and now we use it in my own family. 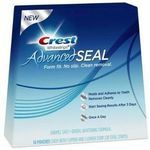 I like this product because over time it does work towards a noticeable whitening of my teeth. Having been a smoker for a number of years, I used this product while I smoked and have continued to use after I stop smoking. Believe it or not, with ongoing use of this product it is very hard to tell that I ever smoked because my teeth are as white as they were before I smoked. Effectiveness It does a very good job in whitening the teeth. You can actually see results after the very first rinse. Convenience I use this product daily, as it does not take any time out of the day to swish it around the mouth before brushing. Minimal Side Effects I have not experienced any noticeable negative side effects. I have noticed that my issues with sensitivity have subsided somewhat since I began using this product. 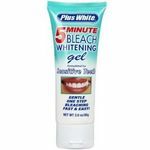 It takes a long time to really notice any whitening with this. I used it along side my regular whitening toothpaste and honestly, I didn't notice much until about a month later. I think because it's so gradual that you don't get the whitening power you want right away but it's just too long of a wait for me for the damage it does. Every other day my mouth and gums would sort of peel off and my gums would be a little tender but not much. Overall I would rather just use regular mouth wash and forego this. The results are too slow and the mouth wash kind of ate away at the skin in my mouth. Effectiveness Takes too long to really see any results with this. Convenience It's easy to use but seems to take a while. Also the flavor is not good and it doesn't leave me feeling fresh. My mouth doesn't smell as good as with their original formula. Minimal Side Effects It kind of peels the inside of mouth! It's minimal but annoying. I was excited to get this product because it looked like a simple way to whiten my teeth. All the other products require messy gels or strips, and I hated that. With this product, you rinse your mouth for thirty seconds. The first couple of days, I had no problem with this product. I realized it was supposed to take time to see results, so I was going to give it a couple of weeks. After the third day of using it, the inside of my lips because very irritate and swollen. I couldn't use this rinse for two days because my lips were stinging so bad! I had been using it twice a day. I decided to try it again, but this time I would only use it once a day. It didn't seem to cause any problems when I was only using it once, but it didn't whiten my teeth at all. I tried it every day for a month, and I saw no results. I was disappointed because I have always been a fan of Listerine products. I would not suggest this for anyone with sensitive gums. So, the Listerine Whitening Mouth Rinse was not for me, but I know other people who loved it. Listerine Whitening Mouth Rinse gives you all the same benefits of traditional Listerine with the added perk of whitening your teeth. Over the course of two weeks I used the whitening rinse twice a day as directed and there was a clear difference in the shade of my teeth. I drink at least one cup of black coffee every day- I use to always get compliments on how white my teeth were but, once I started drinking more and more coffee the compliments subsided. 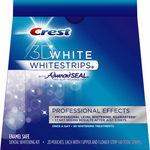 Since I have had bad experiences with whitening strips I thought I would give a rinse a chance. Im glad I did. Not only did it get rid of bad breath and the bacteria that causes it my teeth got much whiter in a quick period of time. Effectiveness This product does what it promises in a quick amount of time. SInce it is less costly than some other rinses its also a win for your pocket book! Convenience Twice a day everyday! Just add it to your daily routine. Minimal Side Effects I didn't notice any side effects at all. Listerine Whitening Pre Brush Rince is Recommended by Hygenists. I am one of those people who is obsedded with keeping their teeth looking as perfect as possible. I have been known to examine my teeth with a led light and scrape away any stains with the tools they have at the dentist. You could say that I am indeed a fanatic. So when I went to my routine teeth cleaning and check up at the dentist I asked the hygenist what was the best product on the market for whitening teeth. She said she really likes Listerine Whitening Pre Brush Rince, because it does a better job at getting in between the teeth than whitening strips do. She said the best time of day to use it is right before bed after you are finished eating and drinking for the day. Effectiveness I use this every night and I have noticed less staining on my teeth, and I am a coffee drinker. Convenience Using Listerine Whitening Pre Brush Rince is an extra step and you have to swish it in your mouth for a minute so on those noghts when you just want to go to bed it can be a bit of a chore. Minimal Side Effects I have tooth sensitivity and I have had no problems whatsoever. Well, this product wasn't exactly what I was expecting but it did freshen my breath. I expected the Listerine Whitening Mouth Rinse to whiten my teeth more effectively. 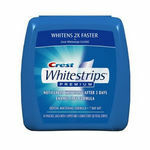 I did notice that this product freshened my breath but it did not whiten my teeth. After about three weeks I stopped using the product because I felt that the Listerine whitening mouth rinse was not working. I feel like this product might work better if your also using a whitening strip, but I wasn't at that time. I did really like that this product is extremely affordable. You can also usually find coupons for this product making it even more affordable in the Sunday newspaper. I also like that it is extremely accessible and convenient to buy and use. This product is very easy to use and has a nice minty taste. Overall the Listerine whitening mouth wash was not a product I would recommend for whitening purposes. Effectiveness Not very effective at whitening your teeth but extremely effective at freshening your mouth! Convenience This product is very convenient. 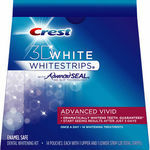 If it whitened my teeth better I would definitely prefer to use it instead of uncomfortable teeth whitening strips. Minimal Side Effects I never experienced any side effects.